The rotation of the solar core may give a clue to how the sun formed. After the sun formed, the solar wind likely slowed the rotation of the outer part of the sun, he said. The rotation might also impact sunspots, which also rotate, Ulrich said. Sunspots can be enormous; a single sunspot can even be larger than the Earth. 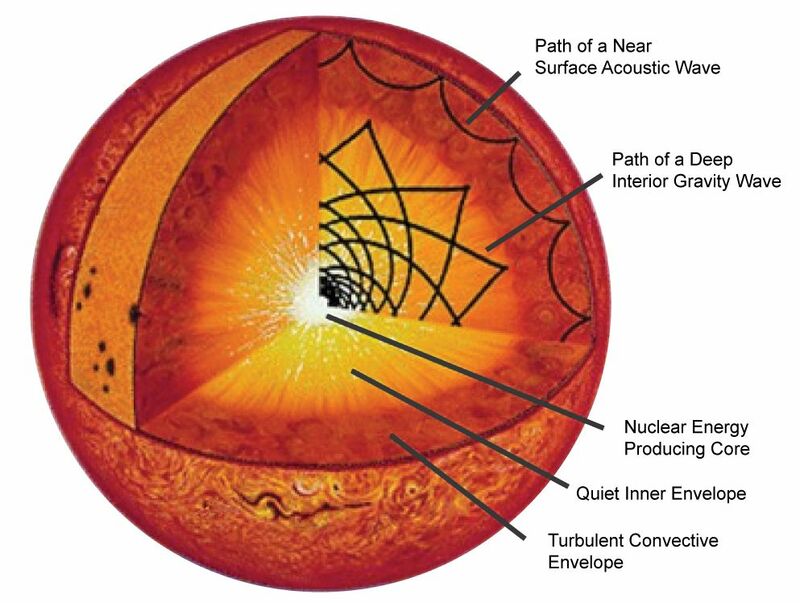 Just as seismology reveals Earth’s interior structure by the way in which waves generated by earthquakes travel through it, solar physicists use ‘helioseismology’ to probe the solar interior by studying sound waves reverberating through it. On Earth, it is usually one event that is responsible for generating the seismic waves at a given time, but the Sun is continuously ‘ringing’ owing to the convective motions inside the giant gaseous body. Higher frequency waves, known as pressure waves (or p-waves), are easily detected as surface oscillations owing to sound waves rumbling through the upper layers of the Sun. They pass very quickly through deeper layers and are therefore not sensitive to the Sun’s core rotation. Conversely, lower frequency gravity waves (g-waves) that represent oscillations of the deep solar interior have no clear signature at the surface, and thus present a challenge to detect directly. In contrast to p-waves, for which pressure is the restoring force, buoyancy (gravity) acts as the restoring force of the gravity waves. [...] “Although the result raises many new questions, making an unambiguous detection of gravity waves in the solar core was the key aim of GOLF. It is certainly the biggest result of SOHO in the last decade, and one of SOHO’s all-time top discoveries,” says Bernhard Fleck, ESA’s SOHO project scientist. ESA’s upcoming solar mission, Solar Orbiter will also ‘look’ into the solar interior but its main focus is to provide detailed insights into the Sun’s polar regions, and solar activity. Meanwhile ESA’s future planet-hunting mission, Plato, will investigate seismic activity in stars in the exoplanet systems it discovers, adding to our knowledge of relevant processes in Sun-like stars. I've not embedded an image showing the p- and q-waves because I've forgotten how to do it, but here is a link to the image. In 2010, Blue Sky Studios visualised a rapidly rotating inner core, instigated by a prehistoric squirrel named Scrat, and that in turn causing a large scale crack-up of sorts. can we reach sun in near future?